R2P (Ready 2 Play) Pet makes a toy line called Sprong that recently caught my eye in our local pet store. Sprong toys come in a variety of sizes and shapes. (You can find them all at Country Max.) I chose the Football shape because it seemed like the most versatile for throwing and chewing. As with all new toys, The Little Blogger loved the Sprong Football for about 10 minutes and then he was over it. But, he does play fetch with it a fair amount now that it’s been around for a while. It’s one of my favorite toys to grab when Teton and I are playing because it feels good to the touch and bounces well on both carpet and hard wood. 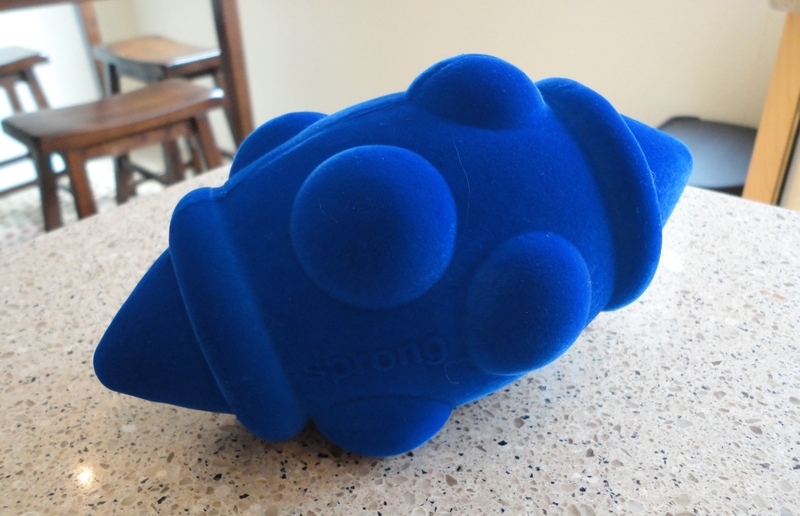 If you’ve got a dog that loves to play fetch, I definitely recommend the line of Sprong toys! Posted on May 28, 2013 by Shannon	This entry was posted in Toy Chest. Bookmark the permalink.